ON THIS DAY, October 3, in 1931, James Whale did some pickup scenes in around the laboratory set and said “Cut!” for the last time, after 35 days of shooting, on Frankenstein. The film was edited and a first preview held in Santa Barbara on October 29. By all accounts, the audience was shocked and Universal understood they had a powerful, unnerving and potentially problematic film on their hands. Cuts were made. The infamous drowning sequence was chopped in half. 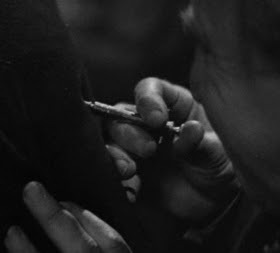 Brief moments thought too violent were trimmed: Close-ups of the hunchback assistant taunting The Monster with a torch, a struggle and a hard blow to The Monster’s head, and a shot of an hypodermic needle jabbed into The Monster’s back. A line of dialog where Colin Clive exclaims, “Now I know what it feels like to BE God!” was buried under the sound of thunder. New scenes were ordered, bookending the film. 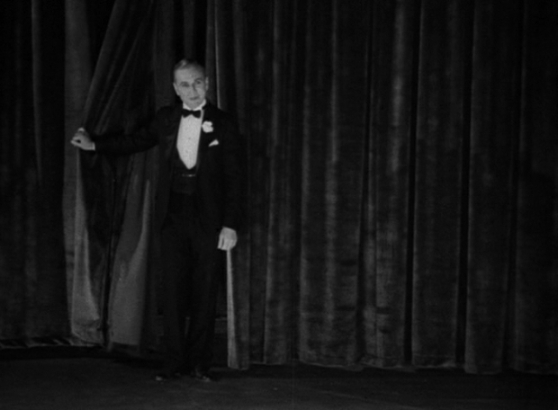 An introductory sequence was filmed with actor Edward Van Sloan stepping out from behind a curtain and delivering a “friendly warning”. Frankenstein, we are told, “sought to create a man after his own image, without reckoning upon God”, as if the film was meant as a lesson in divine morality. Van Sloan cautions the audience that the film might thrill, shock or even horrify, and invites the nervously disposed to leave. The scene was obviously meant to head off critics, censor boards and religious groups who might — and did — take issue with the film. It also serves as good old hype, like parking an ambulance in front of a theater and planting nurses in the lobby. 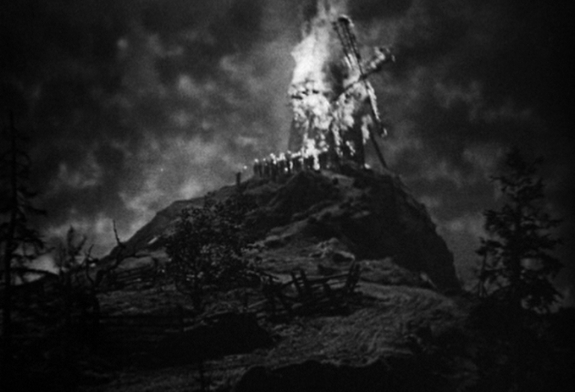 A new closing scene was tacked on after the original ending, a shot of the burning windmill. Clive’s Henry Frankenstein, meant to be killed in his fall, was given a reprieve. James Whale shot a happily-ever-after epilogue featuring Frederick Kerr toasting his son’s survival, and the Frankenstein lineage. Colin Clive and Mae Clarke are replaced with stand-ins, far from the camera. Henry Frankenstein is bedridden, head turned away. 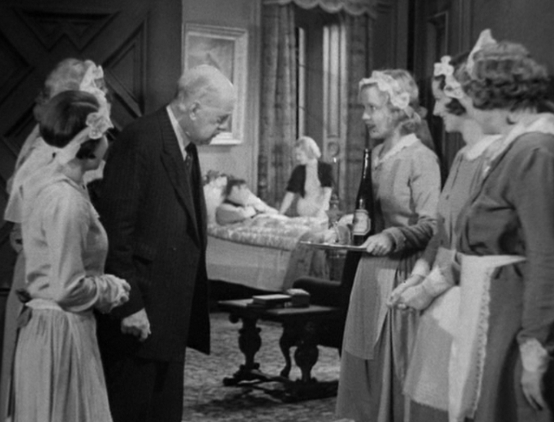 James Whale moved on to film the largely forgotten Impatient Maiden, with Mae Clarke. Colin Clive returned to London, leaving Hollywood on the 27th. Boris Karloff had to buy a ticket to see Frankenstein in a movie house. In the opening credits, his name was replaced with a gimmick interrogation point. Within a few months, Frankenstein would make him a full-fledged name-above-the-title movie star. No doubt, everyone involved hoped Frankenstein would do good business, maybe as good as Dracula, the Bela Lugosi film released earlier that year. Nobody, then, could have known that they had just created what would become the most famous horror movie of all times.